What better party idea than to have your very own popcorn machine for your party or event. With its sweet smelling aroma, you'll be sure to impress your guests with this easy to use vintage style popcorn machine. ?You will be given full guidance on how to use it by one of the team. Includes enough Kernels, sweet flavouring & oil to make 36, 1oz servings - popcorn bags included. ?Schools, colleges, universities and community event organizers please get in touch with us for amazing offers on this machine, we can supply for up to 2000 guests and at amazingly low prices. ?This Popcorn Maker can also be manned by us if required for large events, please email us with your requirements and we will provide you with a free quote. 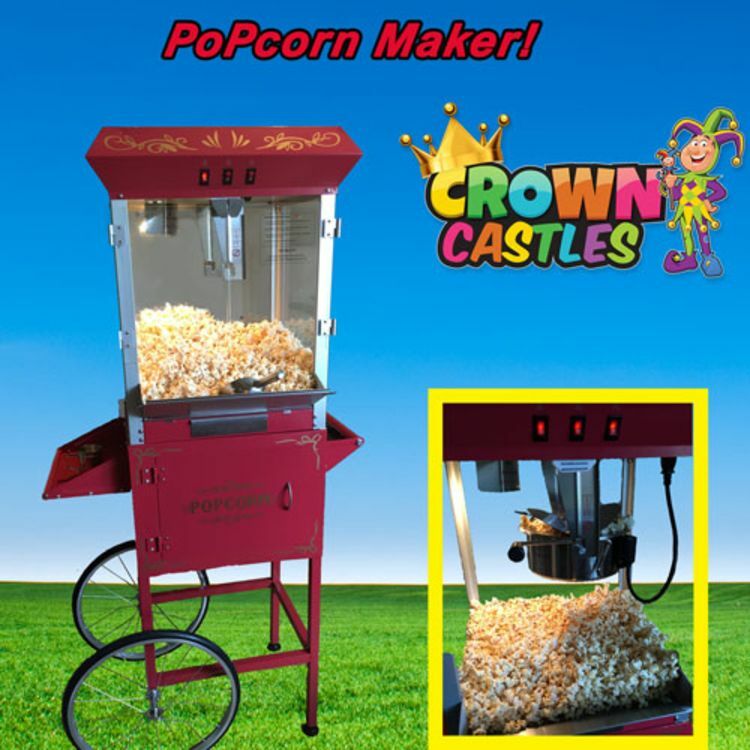 ?HIRE THIS POPCORN MACHINE FOR ONLY £50 BY HIRING ANY OF OUR BOUNCY CASTLES FOR YOUR PARTY AND GET THIS POPCORN MACHINE FOR ONLY £50! SIMPLY SEND US A MESSAGE OR CALL US ON 07495 077542 TO LET US KNOW THAT YOU WOULD LIKE TO TAKE UP THIS AMAZING OFFER. Turn it on, fill it up with corn, wait a few moments and watch as popcorn begins popping out of the pot with the sweet-smelling aroma of fresh popcorn filling the air. We have some fantastic offers for your school fete/event or community fayre and we can supply for up to 2000 guests and at amazing prices too. Staff can also be provided if required. Please email us detailing what you require and we will get back to you with a free quote. Makes a great add-on to any party bag, the children love going home with a freshly made bag of popcorn.